Glenuig Hall was built 17 years ago by the Glenuig Community who raised the funding for the Hall by running Music Festivals annually for ten years. Since 1995 the Hall has held countless concerts, gigs, dances and Theatre events plus workshops, weddings and parties and continues to run a packed Arts programme and the weekly Hub. Over the years the idea of a Mosaic to decorate above the main doorway was talked about and finally over the past year the Glenuig Mosaic project has taken place. At the end of March the project was completed with the large entranceway Mosaic commission and the 51 Community mosaics installed at the Hall. The project involved adults and children from predominantly the villages in west Lochaber including Glenuig, Roshven, Kilchoan, Lochaline, Acharacle, Isle of Eigg, Glenfinnan, Arisaig and Morar, who all made an individual mosaic to be displayed within the Hall. The programme of Community workshops throughout 2011 was led by local Ceramic and Mosaic Artist Helen Michie who also designed and made the entranceway Mosaic. 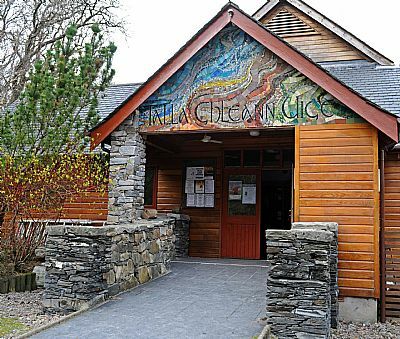 The Glenuig Community Association also commissioned Helen to design and make a large exterior Mosaic incorporating the lettering Talla Ghleann Uige . This Mosaic was made using stained glass, glass mosaic tiles and hand cut porcelain tiles with some found pottery and pebbles from local beaches. The design is an abstract representation of the local landscape using natural materials and muted colours combined with the rich colours of glass and iridescent mosaic tiles to create a varied pattern of textures, shapes and colours.